Inspired by a post from Cranky Pressman, I thought it might be useful to write on the subject of letterpress design vs digital design. Letterpress can be a deceptively intimidating medium for artists who are more attuned to designing graphic works in Photoshop than using physical elements such as lead type, ornaments, wood or metal furniture, quoins or keys, and Gutenberg-era machinery which can (and does) require maintenance and repair and still inevitably results in some inconsistencies (which is, of course, part of the charm). It's been my experience that a great many graphic designers simply ignore these differences and treat the letterpress as if it is just a different kind of digital printer. This means losing out on some of the perks of letterpress which can result in more dynamic, complex, and artistically interesting designs. In this post, we'll examine some of the differences in the tools themselves in order to investigate how this can and should impact our choices in design. Using lead type in lieu of graphic fonts presents certain parameters which the artist should consider before beginning their project. Graphic fonts, unlike cast type forms, come with an unlimited supply of letter forms (in my experience particularly the letters "i" and "e") which may not be available in whatever supply you happen to be using (in other words: it is entirely possible that if you are printing large blocks of text using letterpress you will run out of letters and either have to do another run or mix type which is something you should really really not do unless you have a damn good reason). Additionally, fonts are limited to what's available in the studio, as opposed to what you can download from the internet in a couple seconds (and often for free). This has its pros and cons as well. Several digital fonts, such as Garamond, are not at all like their lead type originators (although Garamond might be a poor example as it was developed at different times by different designers / punchers and is therefor complicated). This means that there are type faces that you'll find more appealing in digital format than in lead type and vice versa. There are also many type faces unavailable in one, but available in the other. So the first step is: know what type faces you have to work with and what supply (in your specific size!) is available. Plan accordingly. Unlike digital design where you can add photos, scans, shapes, and other imaging techniques at whim, letterpress relies on what is physically available. This means: you either find something made for the letterpress, adapt something to work with the letterpress that won't damage the equipment (i.e. is type high and not poky, not corrosive, or otherwise threatening), have someone make it for you, or make it yourself. Find Things: it's still possible to find ornaments, type, and all sorts of letterpress materials on the web and in type foundries. (If you don't believe me, try here, here, here, and here.) Just make sure everything is type high so you don't have to adapt it and understand that type is measured in picas not points (get a pica ruler if you have no idea what this means). Adapt Things: It is possible to adapt materials you find in "the real world" to use as materials for image impressions in letterpress. Just make sure (again) that everything is relatively flat (or at least not pokey) and type high (23.3 millimeters or 0.9186 inch). Some options for this: with fabrics you may try making something like a sandragraph or a pressure print (my basic recipe which I will elaborate more on later: take a linoleum block, place it on the bed, then design something on a piece of paper using artist's tape, cut out shapes, etc. ink block, secure paper with design on it to the cylinder and print!). Keep in mind that this will only pick up the texture of the fabric or outline of the design, and not the color / design of the fabric. Have Someone Make Things: It's still possible to find places who will make you polymer plates of your designs or even artists who will create linoleum blocks or etchings for you. Some examples here, and here. Make Things: Believe it or not, this is probably the easiest option. You can use the methods listed in point one (pressure print / sandragraph) or can: carve a linoleum block, make your own polymer plate with a polymer plate maker, or make your own wood engraving. You can also leave spaces so as to add "elements of the hand" like illuminated lettering, stencils, stamps, gouache, watercolor, etc. later on. In Photoshop, you need only lay out the elements in the position you wish in order to have them print exactly as you want them to (with some exception to the differences in how the software and the printer interpret color and dimensions). With letterpress printing, you must use furniture (made of wood or metal) to "space" your objects. This is very similar to how spacer objects were used in early web design and is not so different from how web designers use absolute positioning to place an object a certain measure from top /bottom or left / right. To determine where an object must lay, you should measure with your pica ruler. Then, place a sufficient amount of furniture around that object so it will print in the right place. You must also register the paper so that it "lands" where you expect it to. For more on how to do a lock up on the press bed, go here. You'll notice that you're limited to whatever size furniture is available (which will take some math and some getting used to) and that you'll also need to "lace" the furniture so that there are no large gaps. Something also worth considering: wood furniture tends to have more "squish" than metal furniture and overall changing the tightness of the quoin can result in the shifting of text / images! Something to keep in mind. In Photoshop, you'll create layers in order to get different colors layered fonts & shapes on to the same page. Using letterpress, every alternate color (unless you're doing a carefully choreographed rainbow roll) as well as anything that overlaps, will require its own run (that means: cleaning / inking the press and making sure the content & the material it is to be printed on are both registered properly). This may explain why a good deal of novice letterpress printers only have a few "layers" of color / overlapping text. Without a doubt, the most distinctive and possibly best-loved characteristic of letterpress printing distinguishing it from digital or offset printing is the impression that is left when the paper is pressed against whatever is on the bed. This impression is also called the "bite" (a heavy impression) or "kiss" (a light impression). 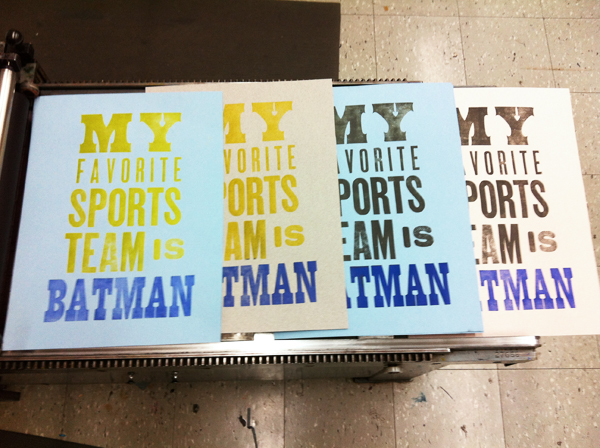 With letterpress, it's possible to leave an impression on the paper without using any ink at all. This is called a "dry stamp" and can be a very effective device when conceptually suitable to the layout of the content. Impression is something that can be changed by raising or lowering the bed (use extreme caution while doing this so as to not damage the equipment!) This is also one key difference you should keep in mind when selecting paper. Thicker paper such as Rives or Arches may result in a different impression than thinner papers. When in doubt, try experimenting with some samples!